LA PALMA — Three candidates have filed nomination papers for two City Council seats for the La Palma general municipal election to be held on Nov. 6. Nitesh P. Patel, entrepreneur/executive; Michele Steggell, La Palma City Council member/Realtor; and Garrett Scott Wada, optometrist/businessman, all filed the required paperwork before the deadline. The three candidates are seeking seats currently filled by Michele Steggell and Kathy Flachmeier. The filing period for City Council nominations began July 16, and, pursuant to California Elections Code, was extended from Aug. 10 to Aug. 15 due to Flachmeier’s decision as an incumbent to not seek election. Elections for the City Council are held every two years and terms for the five at-large seats are staggered. Therefore, all five seats are not up for election during the same election year. Ranked by Money Magazine in 2007, 2011, 2013, and 2015 as one of “America’s Best Places to Live,” La Palma is a 1.9-square-mile general-law city in northwest Orange County, consisting of 15,568 residents and approximately 300 commercial and industrial businesses. The city was incorporated in 1955 under the name of Dairyland and has 55 full-time and 35 part-time employees. 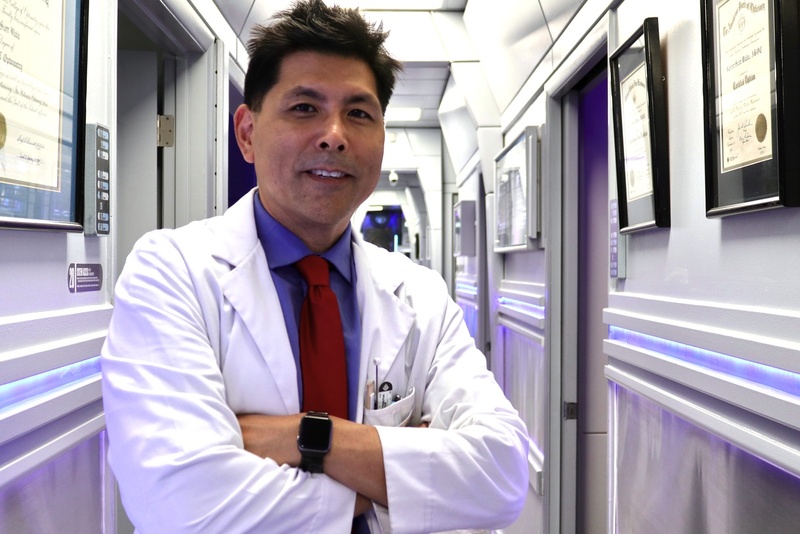 A native of La Mirada, Dr. Wada resides in La Palma and is married to Lea Delacruz-Wada. They have four children, Matthew, Mari, Brett, and Scott. Wada attended primary, middle and high school in La Mirada. During his high school years, he volunteered his time and services with La Mirada optometrist Dr. Steven Sokol and also worked for Warkenton Optical Services in La Mirada, making eyeglasses. Upon graduation from high school, Wada received his AA degrees from Cerritos College majoring in pre-optometry and also from Los Angeles City College majoring in ophthalmic optics. While attending college, he started his own company Wada Optical, where he fabricated prescription lenses for local doctors. Upon completion of his junior college studies, Wada transferred to CSU Fullerton, where he majored in biology. Wada completed his requirements for optometry school at Cal State Fullerton and was accepted to the Illinois College of Optometry in 1989. He received his bachelor’s degree in visual science in 1991 and received his doctorate in optometry in 1993. He served externships with Wesley Jessen, a Chicago based contact lens manufacturer; worked in research and development and as a contact lens consultant; and served at the Warren Barr Pavilion of Illinois Masonic Medical Center in Chicago and the Marysville Academy for abused children. Wada served as an advisor and instructor for the National Education Center (Bryman College) in Anaheim for its ophthalmic optics program. He also taught optometric assisting at Cerritos College in the Department of Life-Long Learning. He was a quality management auditor for A VP-Foundation Health and is currently on the Peer Review and Quality Management committees at Delta Vision and serves on the Public Policy Committee at Delta Dental. Wada is a certified dispensing optician, certified contact lens fitter by the National Board of Opticianry, and a TPA licensed optometrist. He was also selected as an expert examiner for the National Board of Examiners in Optometry. He has licenses to practice optometry in California and Hawaii and also has a current license with the Department of Real Estate in California. With a great interest in public service, he has devoted much of his life to supporting the youth through the local Optimist Club. The Suburban Optimist Club raises money to offer scholarships and recognition programs to honor the youth. Wada was on the board of directors for three years, Vice President one year, and president in 1998-1999. He is also the current president of the Suburban Optimist Club Foundation. As of this year, Wada has been in private practice in Anaheim for precisely 25 years. He has also served as an ambassador for the Anaheim Chamber of Commerce and secretary of the Walker Manor Condo Association in La Palma, and is an ongoing member of Cerritos Baptist Church. In 1998, Wada made an unsuccessful run for La Palma City Council but had an excellent showing without a high-profile or high-financed effort.